Jane is our office Manager. She joined our team after many years as a Dental Hygienist. Her family loves to rope and compete in rodeos and roping events. Her spare time spent watching any of her three boys playing sports or just spending time with her husband. Jane is very excited to be working with such an Amazing Team at Clock Tower Ortho and loves working in the field of Orthodontics. Michele has lived in Idaho since 1995. She has been married for 23 years and has 3 great children and one awesome yellow lab! Michele adores spending time with her family and watching her kids play sports. She owns a dairy with her husband... but doesn't drink milk! :( She also loves a good joke! Nellie is our Scheduling coordinator. 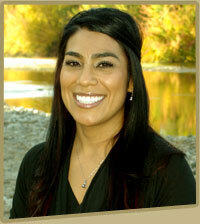 She fell in love with Orthodontics when she started her journey in dental assisting school at College of Western Idaho. She had the privilege of working as an assistant for a year before making the move over to the front desk. Nellie truly enjoys her time working with an amazing team. Her favorite part of working at Clock Tower Ortho is seeing all the excited faces when patients begin and finish their journey of improvoing their smile. Nellie absolutely loves going on trips with her husband. She also likes going on walks at the greenbelt near her house because the sound of running water relaxes her. One of her favorite hobbies is taking pictures of unique objects. Most of all Nellie loves spending time with her family and having summer BBQS. I have been working in the Orthodontic field since 2002 and joined the Clock Tower Orthodontics Family in 2012. I have enjoyed watching our practice and patients grow over the years as we continue to provide outstanding,professional service to our community. I have an opportunity to work on great patients and get to know them on a personal level. The change in their smile and confidence over time is one of my favorite aspects of the job. I have been married for 24 years and have three wonderful loving kids that are my pride and joy. I also have 2 energetic dogs. When i'm not at work I enjoy spending time with family, traveling and going to the movies.